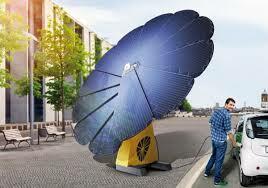 Smartflower has developed 3 models of all-in-one solar systems that follow the sun throughout the day. This allows for the greatest use of the their solar panel surface area for the longest time possible. Much like a real flower, the Smartflower unfolds (or blooms) as the sun rises, rotates to follow the sun throughout the day and then folds up on its own at night to take up the least amount of space. This, along with other proprietary technology, help Smartflower models run around 40% more efficiently than standard rooftop solar panels. It is even smart enough to fold up and retract in high winds or violent weather to avoid possible damage. The detailed video below has more details. The Austrian based company offers 3 different models: Smartflower POP, POP+ which stores power on grid or off, and the Smartflower POP-e which has a plug for an electric car. Smartflower has recently set up a reseller office for the United States in Boston and begun maintenance training in Los Angeles, California. While solar power has come a long way in recent decades, it is still 5 to 7 times more expensive to generate electricity than coal, hydro or nuclear alternatives (mostly due to the cost of the semiconductors). Hopefully this more efficient use of the panels that Smartflower has pioneered can help offset this increased cost. Next Want To Get The Ducktales Reboot Theme Stuck In Your Head?